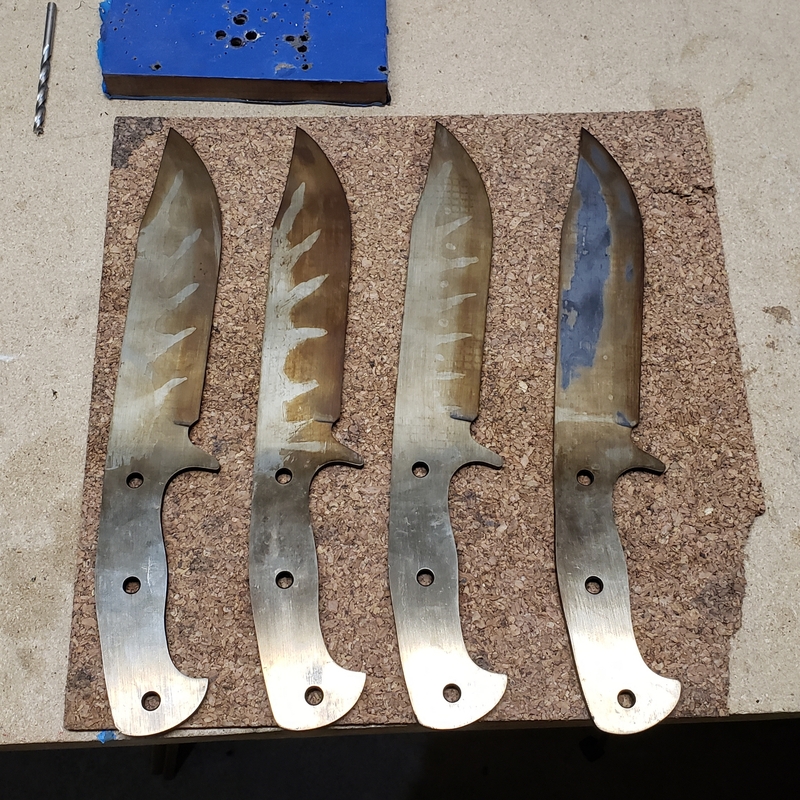 Going to heat treat those 4 bowies this weekend. The steel is 1075 from NJSB and I have only done stock removal to them. So my little forge is what I'm going to use. Is thermal cycling necessary, I think I know what everyone is going to say but want to make sure as I do not have a way to tell temp. It's all going to be by eye and magnet. I always seems to get confused on the thermal cycling. Take above critical and then down in temps after that right? I just dont want to do more harm then good. Oh I forgot to add after I thermal cycle then I was going to apply satinite clay for my hamon pattern. How old is your steel? I mean, have you had it for a while or was it recently purchased from Aldo? I just purchased it about a month ago. I think that's from his new batch, which I have not personally used but I've gotten a few phone calls from friends and heard other stories of people having issues with it. It wouldn't hurt to thermal cycle, or better, normalize then thermal cycle ANYTHING from Aldo. Or better still, stop buying steel from Aldo. LOL...well that's not good! Where are you getting your 1075 from? But John let's say your normal heat treat with hamon on 1075. You've hit the high points. The steel is what may throw a wrench in your plans. But yes.....that's where I'd start. Just about all I’ve ever used is 1084 from Aldo. I have some 1075 that I bought a few months ago. What’s wrong with it? One doesn't need to look very hard to find numerous (dozens, if not more) RECENT reports, some from some very established and capable makers, who have had a laundry list of problems with his steel. Problems include but are not limited to: severe warping issues, hardening problems, tempering problems, normalizing problems, chemistry WAY out of spec for given composition (like a completely different steel than advertised), hard/soft spots in same blade, etching issues, finishing issues, general 'weirdness' and unpredictability. I've had personal experience with some of that. At some point one has to wonder if its worth it anymore. My time is too limited and valuable to trouble shoot major issues with steel, especially when *to my knowledge* no certs/heat numbers have been provided to help the makers troubleshoot and makers are instead told they must not know what they're doing. As I type this, I realize this is probably better in a separate thread so we should probably take further discussion of this elsewhere. Sorry for the thread derail Justin. Justin, for good hamon with 1075, keep your austenitizing heat on the low end and your clay thin. Here they are clayed and after quench. They are in the oven tempering now. Fingers crossed. All of them skated a file so that's good, time will tell on the hamons. Looking good Justin! 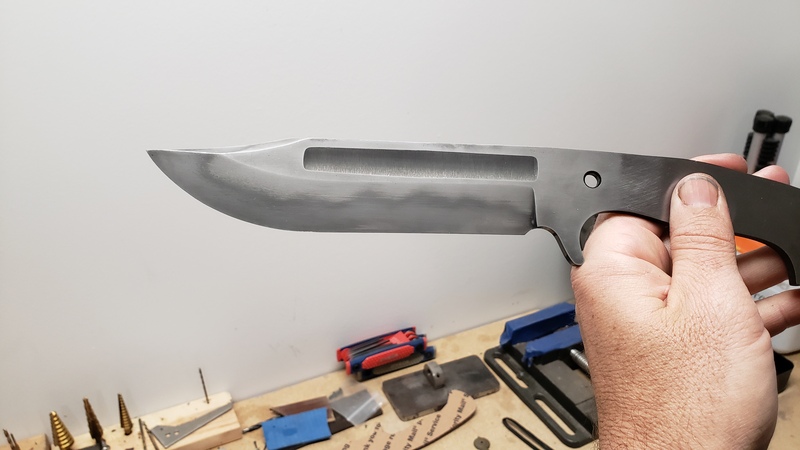 I have one in 1075 that’s almost ready to heat treat and it will be my first attempt at a hamon. Watching this thread very closely. Here they are after tempering. The one on the right I did not clean up very good after normalizing and thermal cycling so it alot of decarb, scale junk or whatever on it so I'm not sure how it's going to turn out. It also has some weird spots on it. Those look really nice. Can't wait to see the finished produce. Also this is a timely thread for me. I just cut out the profile for a small skinner using W2. I'm thermal cycling it right now. Success! Not nearly as active as I would have liked but I think I know a few things I could do different.